designsbyambershaw: Toot Toot!! Come on ride the Train! Welcome the Blog Train Blog September Train!!! Make sure to read the entire post to learn of other freebies and offers!!! I hadn't participated in a blog train in a few months and had really missed doing so! 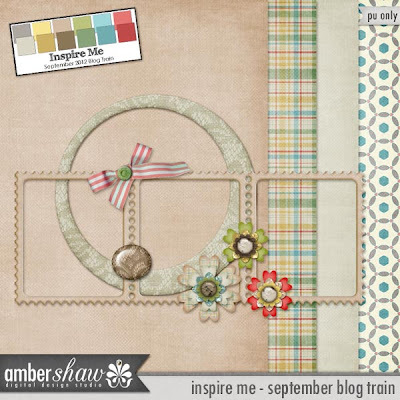 I really loved the colors for September and the theme "Inspire Me" ... I am always inspired by vintage items, and always flowers! I hope you love the flowers and lace in my portion! Also DO NOT miss Exclusive freebies by missing out on my newsletter. Sign up today for Exclusive content, freebies, info on sales and releases! I hope you enjoyed the blog train and have a DIGIfull weekend! Thank you so much for this post. I want to let you know that I posted a link to your blog in CBH Digital Scrapbooking Freebies (please, notice the new url for my blog), under the Page 3 post on Sep. 01, 2012. Thanks again. Thanks for both of these beautiful goodies, Amber! Love the new kit! Thanks for the blog train kit, like the flair and the flowers.